Yesterday, Me and my Mom went to Home Depot to get some narrow cement hollow blocks to make a narrow garden bed along our north fence. Something my Mom has been asking me to build/fix. I also decided to get some PVC pipes and connectors to build a cold frame that I want to put over Veggie Bed #2 to protect a Pomelo tree and extend my Peppers growing season, since it’s starting to get cold. I quickly drew a sketch for the cold frame and figured out what supplies I needed. 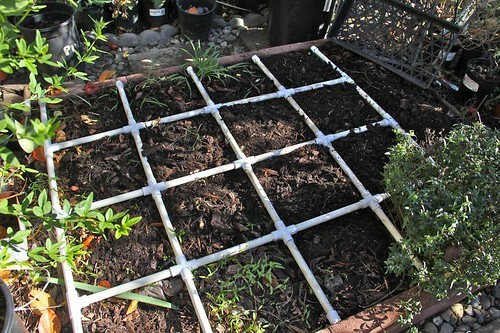 As I was gathering the PVC pipes and connectors, I had another idea to make dividers for my SFG (Square Foot Garden). So I got more connectors and pipes and somehow got all of these to fit in my Honda Civic Coupe… Note that those PVC pipes were 10 foot tall! Once home, I started to assemble the cold frame, but it started too look like my plan wasn’t going to work, since I couldn’t bend the pipes as much as I could. 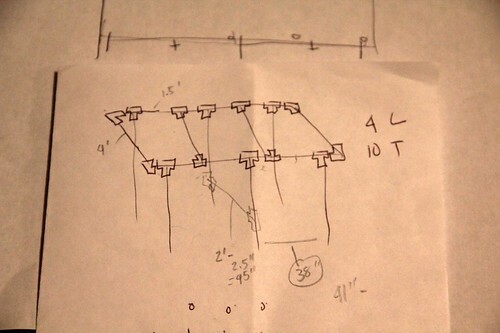 So I sketched another plan and decided to leave this project for tomorrow when I can get more connectors and pipes. So I put my cold frame plans aside and built out the SFG dividers. I figure out to cut the pipes into 10.25 inch length. When I add the connectors to it, it comes out to about 12 inches center to center, which is the right size. Not bad. I was really happy with it. This will definitely last longer than my other failed attempts using nylon rope (which disintegrated after a season), dowels (which warped and just got old) and wire (which was hard to see).